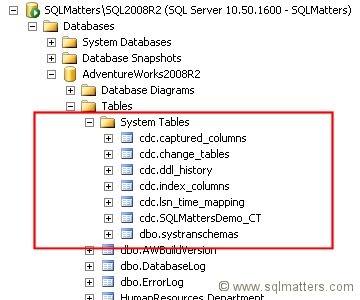 Change data capture (CDC) is a method for tracking changes to data values in tables. This is useful if, for instance, you want to identify which rows of data have changed in order to load only changed rows into a data warehouse. Prior to the introduction of CDC you would have typically had to do this by adding a trigger or maybe a timestamp (rowversion) column to identify changed rows. In this short article I'll show how to set up CDC to track data changes to the Production.Product table on the AdventureWorks2008R2 example database. This takes just two lines of code ! You can download the AdventureWorks2008R2 database from Codeplex if you don't already have it. In this case I've chosen to track changes on the Production.Product table, on the Name, Color and ProductId columns. If I had left the @captured_column_list blank then all columns would have been tracked. Note that you do need to include the column (or columns) that make up the primary key so that the CDC mechanism can uniquely identify a row (though instead of a primary key it's also possible to specify a separate unique index for this using the @index_name argument). The @capture_instance is a name that identifies this cdc instance (more on this later). That is all that is required to set up CDC ! However Microsoft recommend that these tables are not accessed directly and that the functions they provide are used instead, which I'll demonstrate below. First I'll make some changes to the table so we can see how they are picked up by CDC. The code below updates three columns, only two of which are in the list of columns to be detected by CDC. I've run a select before and after so that we can see the changes. The first result gives the net result (i.e. if there are intermediate updates then only the final result is shown) and all changes (i.e. any intermediate updates are included). In this case there is only one update, which updates the Name, Color and ProductNumber columns. However only Name and Color are included in the columns for change detection, so the update to ProductNumber is not included in the results. 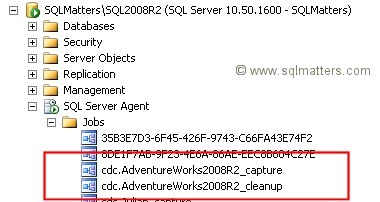 Could not update the metadata that indicates database AdventureWorks2008R2 is enabled for Change Data Capture. The failure occurred when executing the command 'SetCDCTracked(Value = 1)'. The error returned was 15517: 'Cannot execute as the database principal because the principal "dbo" does not exist, this type of principal cannot be impersonated, or you do not have permission.'. Use the action and error to determine the cause of the failure and resubmit the request. The solution is to change the database owner to an existing login (using sp_changedbowner or ALTER AUTHORIZATION for instance). Msg 22943, Level 16, State 1, Procedure sp_cdc_enable_table_internal, Line 279 Columns used to uniquely identify a row for net change tracking must be included in the list of captured columns. Add either the primary key columns of the source table, or the columns defined for the index specified in the parameter @index_name to the list of captured columns and retry the operation. I hope that gives a brief overview of CDC, though there is much more capability that I've not covered in this brief article. Although CDC will work well in many situations there are circumstances where it won't work. For instance it does need SQL Agent to be running and only works on the Enterprise, Developer or Evaluation editions (so not with Standard or Express). It also doesn't record who or when the changes were made (which will probably rule it out for auditing type requirements).